Vineyard Vines has been named the "Official Style of the Kentucky Derby" for five years in a row, and it's no wonder based on the collection they prepared for the annual event. This year, Vineyard Vines is celebrating the Kentucky Derby with a range printed shorts, colorful belts, and, of course, hats, that will provide you with all the derby-dressing inspiration you could possibly need. I don't quite understand how the Kentucky Derby became such a huge, celebrity-attracting event, but I'll take any excuse to see Lauren Conrad's latest DIY project, check out whatever Olympic figure skater Johnny Weir is wearing this year, and test if I'll win or lose by betting on the most ridiculously named horse. It's like the best red carpet event to happen in the Midwest... and minus the actual red carpet, of course. 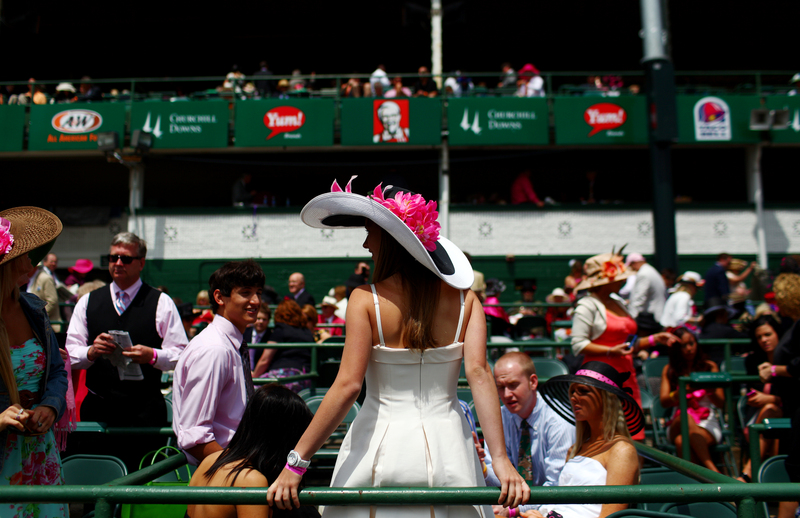 Whatever your excuse for attending the horse race (or keeping track of the results from afar), be sure you look the part of a regular hat-wearer and derby-goer in a dress, a new scarf, or a derby hat by Vineyard Vines. All pieces are available online currently, and you can check out the collection below. I'm betting (sorry not sorry!) you'll find your perfect derby outfit among the selection. If skirts and dresses aren't your thing, the brand created printed shorts with matching tops into their Kentucky Derby collection. You'll definitely stand out to the paparazzi by sporting this totally unexpected derby outfit. If you're bringing your kids to the derby, Vineyard Vines also has their derby outfits covered. Choose from any one of these adorable printed shirts and match it with hat to be sure they can see their favorite horse racing toward the finish line. Like any Midwestern state, Kentucky is likely to get far cooler at night than it is during the day. Be prepared with a derby-inspired scarf, matching hair clips, and a tie in case you wind up staying out drinking mint juleps after the sun goes down. Is a derby outfit really complete without a colorful belt with horses? Easy answer: no. Pair one of these colorful belts to the aforementioned shorts and you'll be ready to stand up and cheer for your favorite horse the second he takes the lead — you know, without the fear of a wardrobe malfunction. Also, it would look great as a waist belt for any derby dress. Looking for the perfect derby hat, but don't want to rival the Queen of England? This simple straw hat will go with any derby outfit. I'm normally against couple-matching, but the Kentucky Derby basically calls for it. You can match your S.O. without going over the top with these matching belts for her and bowties for him. This way you won't lose each other in the crowd — and you'll score some major #relationshipgoals pics!